Rue du Roule 12-14, 75001 Paris, Frankreich. 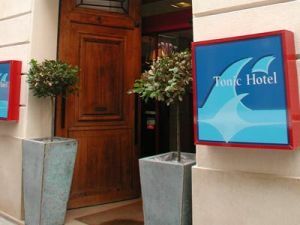 The Tonic Hotel is a Parisian “Hotel de Charme” situated in the very centre of Paris, just by the Louvre, at walking distance from most of the major Touristic and Cultural points of interest. You will be able to walk easily to the Louvre of course, but also to the Tuilleries Garden, to the Orsay Museum, to The Pompidou Centre and its Modern Art Museum. Just across the River, walking 10 minutes, you will find yourself in Rive-Gauche, in the heart of the Quartier Latin. The Notre Dame Church is also at 10mn of a very nice walk. We also are in middle of the very popular shopping area of Rivoli Street with its multiple shops of Rivoli and the Commercial Centre of Les Halles. There are 8 lines of subway going through the nearest Metro station of Chatelet-Les Halles; the main train stations as well as the 2 airports are direct from it. All our rooms are equipped with bathroom (and hair dryer), telephone, mini bar, free satellite TV, pay-TV system, and air conditioning. You will be able to connect your laptop to the phone in the room or use the Swiss COM Wi-Fi network. Guests are welcomed among soft colours, flowers and stylish furniture. Rooms can be on the back if requested, if not, they are luminous, giving refined and functional comfort. 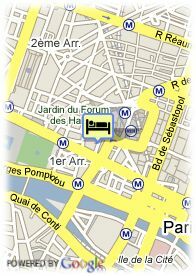 At the front desk, you will find all the help needed to have a nice stay in Paris. We will provide information, reservations and all the necessary assistance to make your stay unforgivable. Internetleistungen und WiFi sind gegen Zahlung vorhanden.Es gibt Internetleistungen (Computers) in der Vorhalle (gegen Zahlung). Bahnhofsnähe, Stadtzentrum, Museenviertel, in der Nähe der U-Bahn / Strassenbahn, in der Nähe der Einkaufszentrum. Weniger als 3 Tag(e) vor Anreise : 1 Nacht zu zahlen. We have Many Breakfast offers From Express to Buffet to choose at arrival time or in the morning, following your appetite and your budget. Our Bar is open from 6.30 pm but our staff will be pleased to serve you at any time. in the very centre of Paris, just by the Louvre, at walking distance from most of the major Touristic and Cultural points of interest. You will be able to walk easily to the Louvre of course, but also to the Tuilleries Garden, to the Orsay Museum, to The Pompidou Centre and its Modern Art Museum. Just across the River, walking 10 minutes, you will find yourself in Rive-Gauche, in the heart of the Quartier Latin. The Notre Dame Church is also at 10mn of a very nice walk. We also are in middle of the very popular shopping area of Rivoli Street with its numerous shops and the Commercial Centre of Les Halles. There are 8 lines of subway going through the nearest Metro station of Chatelet-Les Halles; the main train stations as well as the 2 airports are direct from it.